A proposed law would help clean New Jersey waterways by requiring all new Jersey roadway authorities to use ONLY native plants for landscaping, land management, reforestation and habitat restoration. 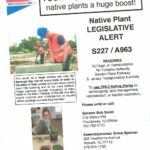 Please write or call your State Senator and Assemblyperson. Consult this handy guide to find your New Jersey State legislators. It’s a funny thing, but completely logical when you think about it. One strong environmental indicator that a polluted body of water is clearing up, is birds returning to spend time around it. Birds eat insects and fishies, which don’t thrive in heavily polluted waterways. So when those creatures return, birds are the next neighbors to move in. Something similar happens in neighborhoods where native plants are present. I learned at Bowman’s Hill Wildflower Preserve that an insect automagically knows the difference between a native plant and an imported one (called an exotic) that look identical to us. Insects are able to eat plants that are native to their ecosystem but they cannot eat the pretty plant that looks the same but is from a different part of the world. The result of planting native plants or fostering their growth, is an explosion in the bird and wildlife populations of your neighborhood. This lovely New York Times Op-Ed piece explains in very accessible language exactly why this is true. Contributor Douglas W. Tallamy makes a nice case for why we should care enough about this phenomenon to stop planting for aesthetics alone and instead, consider the overall ecological benefits of the plants we choose to nurture and introduce to our own local ecosystem – which they will make or break. On a side note and of especial interest to journalists, take a look at the photo inset featured in my screenshot. This is the first time I’ve seen an inset be a link to a photo gallery – access it by clicking anywhere in the inset area.